Julie and I partnered with Mighty Spark Food Co., and recipe developer extraordinaire Patty Mastracco, to create a perfect Paleo recipe that will excite your taste buds and wow your friends and family by showing them that healthy can taste good. 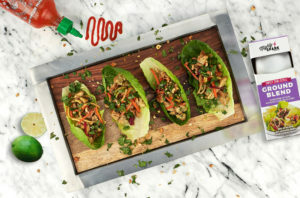 Using Mighty Spark’s Sweet Thai-Style Premium Ground Chicken, already pre-seasoned with ginger, Kaffir, lime, cilantro, curry, soy sauce and Thai chili peppers, we created a quick and easy lettuce wrap recipe. Even if you’re not a Paleo follower, you’ll love this dish that can quickly be made in under 30 minutes for a convenient weeknight meal or perfect for entertaining this patio season. What’s more, you can feel good about choosing Mighty Spark. Not only do they make top-quality meat products, they’re committed to giving back. Mighty Spark’s one-for-one giveback program is their Bite Back Hunger program. For every Mighty Spark purchase, the company donates a meal to those in need. Mighty Spark partners with non-profits Kids Against Hunger and Children Hunger Fund for their meal donations, and they expect to donate more than 2 million meals to children in need in 2018. Mighty Spark products can be found at select retailers nationwide. Check out the store locator on their website to find a retailer near you. Chopped roasted, salted peanuts and fresh cilantro leaves. Stir together honey, lime juice and soy sauce in a medium bowl. Stir in cucumber, carrots, ginger and green onion and set aside to marinate. Heat sesame oil in a medium skillet over medium-high heat. Add ground chicken and break up with the back of a wooden spoon. Cook for 5 minutes or until lightly browned and cooked through. Let cool slightly. Spoon equal amounts of cooked chicken into lettuce leaves and top with marinated vegetables, peanuts and cilantro. This is a sponsored post. All opinions are those of Julie Upton MS, RD, CSSD and Katherine Brooking MS, RD.